Mitox was introduced into the UK in 2005 and has since become one of the fastest growing garden machinery brands, earning popularity with home and landowners who have recognised the outstanding quality and value that Mitox products deliver. 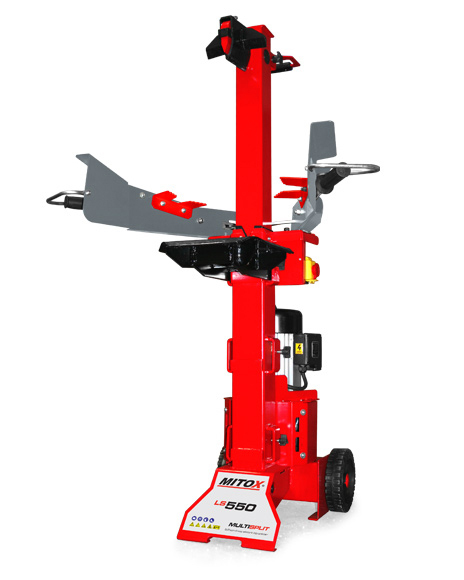 The Mitox LS550 vertical log splitter has a 3000 watt mains electric motor which produced a splitting force of 5.5 tonnes, sufficient for demanding domestic wood splitting tasks. this machine has a compact frame and is easy to move with large grip handles. Logs of up to 106cm/42.4 inches long and 30cm/12 inches in diameter can be split in seconds. Toothed grippers firmly hold the log in place. Then simply depress the two control switches and the reinforced pushblock drives the log into the fixed multisplit four way splitting wedge saving time compared to having to split the same log more than once. When working with shorter logs, Mitox’s Quicksplit adjustment allows the pushblock starting position to be changed so the machine will work at a faster stroke. The splitting table can also be adjusted through three positions to suit the size of wood to be split. A 5 metre long mains cable is standard, and gives more flexibility finding the best working position even is this isn’t right next to the power outlet. The two handed operation with hand guard prevents the possibility of the operators hands being pinched by the log splitter. As soon as the switch is released, the pushblock returns to its start position. Norwich Road, Horstead, Norwich, Norfolk, NR12 7EE, telephone 01603 738635 and Hillside Nurseries, Shipdham Road, Toftwood, Dereham, Norfolk, NR19 1NP, telephone 01362 699888. Free delivery available to customers in Norfolk and the Waveney Valley area of Suffolk. We supply Mitox products full assembled, pre-delivery inspected and test run. We give a full handover of garden machinery with both operational and safety instructions to our customers. We provide full service, parts and warranty support to every machine we sell. In order to provide this comprehensive service, we do not offer this machine for distance sale.